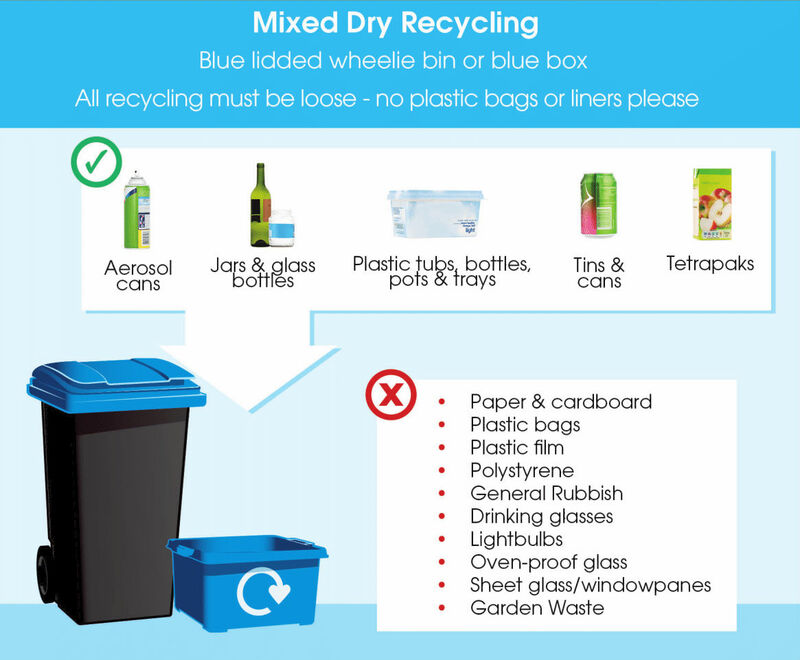 To avoid problems with your bin collections please ensure that you are putting the right waste in the right bin. To reduce your waste please recycle as much as possible. 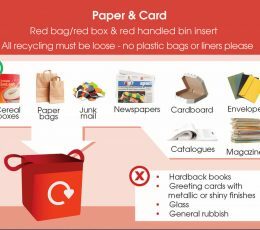 Check your bin collection day to find out which bin or bag you should put out on which week. Food recycling is collected every week. 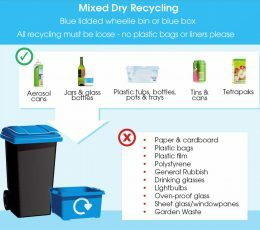 Please see our guide below as to what you can and can’t put in your bins regular bin collections. You can download our leaflet for Seagull Proof bags here. We offer free Assisted Collections and Clinical Waste Collections, and paid for Garden Waste and Bulky Waste Collections. Empty aerosol cans – without their lids. Washed-out plastic bottles including drinks bottles, milk bottles, cleaning fluid bottles (for example washing up liquid bottles), clean shampoo bottles – without their lids. Washed out plastic tubs, yoghurt pots and ready-meal trays. Drinking glasses, light bulbs, oven-proof glass, sheet glass or window panes. 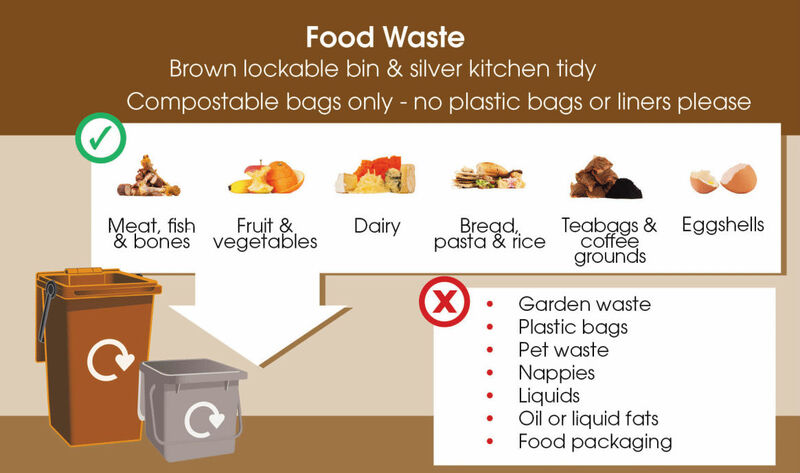 Please do not put your kitchen caddy out for collection, use your brown outside lockable bin. 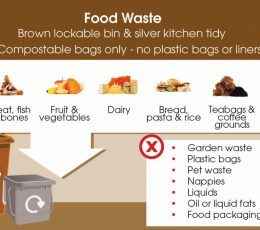 Don’t put food recycling into plastic bags or cling film. Plastic will not compost. Plastic bags that claim to be 100% degradable are not suitable for composting so please do not use them. You may use newspaper or compostable liners. Plastic bags or cling film. Pet poo or cat litter. 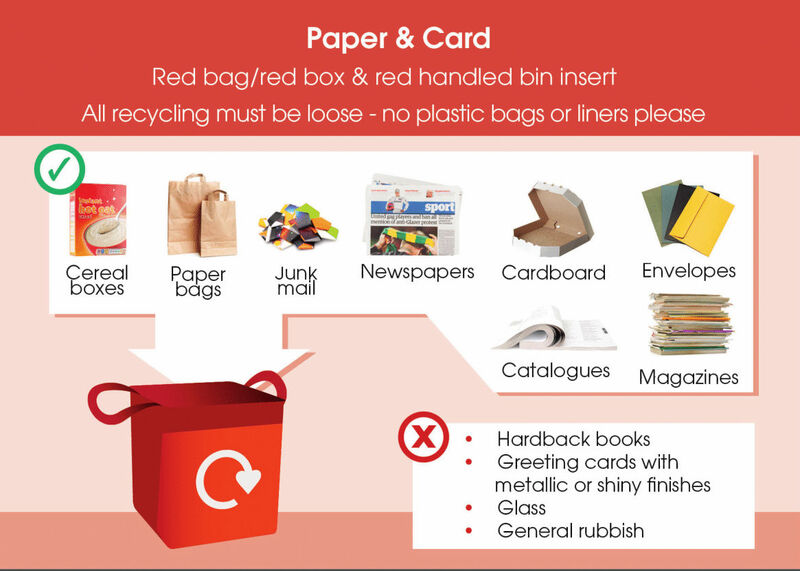 Paper – newspapers, magazines, envelopes, phone book, Yellow Pages, printer paper, paper bags, leaflets. Packaging boxes (large cardboard boxes must be flattened). Pizza or food boxes (make sure all food traces are removed), ready-meal sleeves, cereal boxes. Greeting cards (make sure cards do not have metallic or shiny finishes). Greeting cards with metallic or shiny finishes. 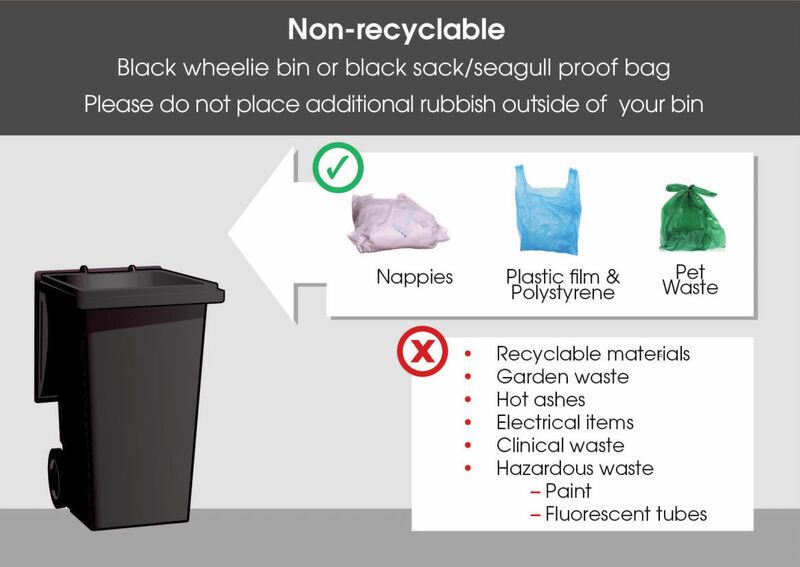 Don’t put loose domestic waste into your black lidded bin – please put your waste into bags and then into your bin. 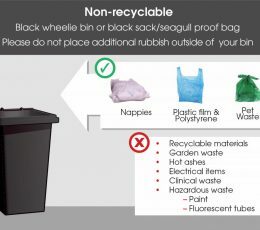 You can also buy wheeled sized big bin liners from your local supermarket to help keep your wheeled bin clean.